Thanks for this post, Dan. You sound like me, the purist, but somebody has to do it. I’m glad you made it clear that 90% of Shrimp Creole available to the public is not even close to the good stuff. This is one of the mainstays of Creole, and Cajun, dishes and it is awful how it has be screwed up all across the country. Do if even if it sound mundane, Dan. I tried your shrimp creole recipe a second time. I thought it was great the first time without the shrimp stock, but it was incredible with it. You’ve turned me into a believer of taking the time to make a good stock first. It it well worth the time!! I see a lot of lemon slices in the picture, but not in the list of ingredients. What’s up? Lemon isn’t usually in NOLA cooking unless it is a side accompanyment. Sandy – It’s the fifth ingredient down. To each his or her own, this happens to be my recipe. 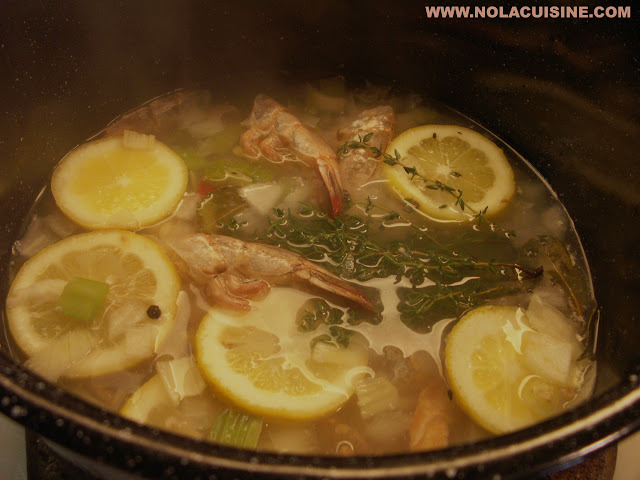 Many restaurants do use whole lemons in their shrimp stock, including Commander’s Palace, Brennan’s, and Galatoire’s (plus a few other no namers); also lemons are often used pureed into large batches of Turtle Soup. It’s kind of a broad statement to say that “Lemon isn’t usually in NOLA cooking unless it is a side accompaniment”, isn’t it?? Much of the cuisine is based around seafood. Lemons are everywhere. The only edit I’d make to your recipe is not to bother with chopping the onions and celery – you are going to simmer the stuff for 45 min, after all. That being said, for some reason I always at least halve my garlic cloves, though I can’t tell you why. On the lemon question, I usually squeeze a lemon or two into the stock, but don’t use the rinds. Unfortunately the only shrimp I have access to for stock is in frozen head-on bait form. That said, the heads contribute massive amounts of flavor and oils compared to the shells, at least that’s what it seems. I’ve used just under HALF a pound of heads, tails, and shells to make a pretty shrimpy shrimp soup, but I’ll be seeing if this will work for the shrimp stock recipe. My questions are: have you ever used shrimp heads in your stock? is it safe to consume head-on “bait” shrimp? I’ve always lived close to the water in the pacific northwest, so for the past few years I’ve regularly cried myself to sleep at night thinking about clam bakes and oyster shucking. My dad will send me home with salmon fillets he caught and smoked himself, but I’m all out and I WANT SEAFOOD! Oh yeah, this stock recipe is delicious. As for using celery and onions, they definitely came through when I made it. Just make sure to keep it at a low simmer to retain the flavors and aromatics. (Being a supermarket sucker, I was worried about the wax on the lemon rinds though.) Great recipe! I have to admit I was a little weary of attempting a seafood stock, but I more or less went with this recipe and it’s great. I swapped the onion for a little more volume of chopped leek, tossed in some parsnips, and sweated the leek, parsnip, and celery in some olive oil first, threw the shells and tails on until they were pink, and then piled on the garlic and lemons for about a minute before I started adding the cold water. Very good stuff; I was surprised by the amount of shrimp flavor that comes out of those shells/tails so quickly and by what an amazing touch the lemons added! The Shirmp and Veg have to be Sautee’d W/ Butter or oil before covering with cold water…. This allows you to extrack more flavor from the shrimp and the veg.